I invite you, sister, to take a moment with me now: Read this Scripture once more. Close your eyes and try to imagine what the moment after Jesus’ baptism may have looked like. Ask the Spirit to bless your holy imagination; ask Him to show you. Saint Mark’s description is striking. He doesn’t write, “the clouds gently parted,” or “the skies opened up”—no. The heavens were torn open. This moment of Christ’s baptism is powerful as God calls Him His Son! Similarly, when we receive the sacrament of Baptism, God rushes into our lives and completely transforms us by His Spirit. We truly become a new creation and are made His children. In this Christmas season (yes, it’s still Christmas! ), we celebrate the great mystery of the Incarnation. What a gift it is to have a God who desires to be so present to us. He desires it so much that He comes down from Heaven and breaks into our world as an infant. His very name is Emmanuel, God with us. He institutes the Eucharist, that each time we go to Mass, we might receive Him—Body broken, Blood poured out—into our own bodies. Christ dies for us, that we might have new life in Him: the gift we receive through Baptism. God is waiting to tear into our lives, sisters. He wants to bless us! Pray with me today, that the Spirit would open our hearts in this new year, that God might break in and radically transform our souls in an everlasting way. Spend some time in prayer with Jesus. Ask Him to show you what elements of your life He desires to make new. How might He be calling you to live out your Baptism more fully? I couldn’t sleep at all a couple of nights ago. I was just completely overwhelmed with anxiety. I got on Pinterest and was looking at essential oils for anxiety and one of the pins was like 4 scripture verses to help with anxiety. So I read them – no great sense of relief but it reminded me about a screenshot from daily devotional a friend of mine had put on Facebook. So I searched for daily devotionals. 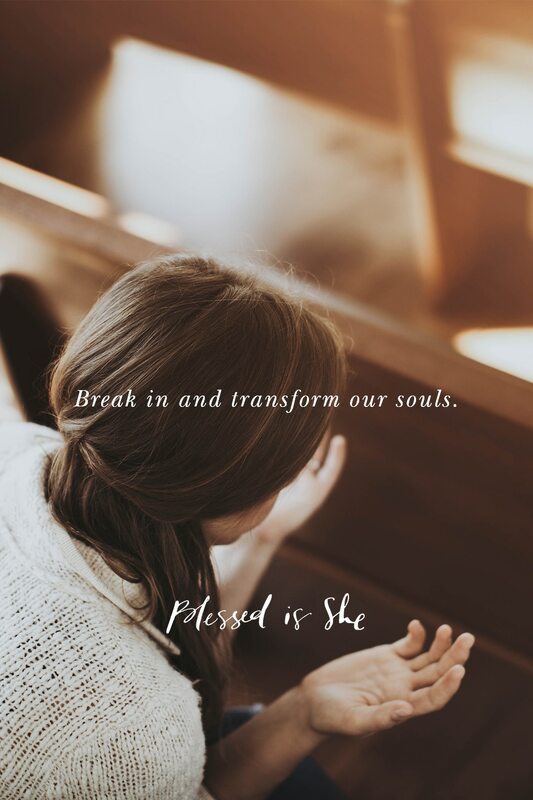 It should probably be mentioned that I struggle with my faith daily, it’s not Jesus I struggle with but the actions of “Christains.” Anyway I came across Blessed Is She.. whatttt this is for Catholic women?!? I was actually really surprised and excited that it’s design was awesome and seemed relevant to 2018. So I read Tuesdays mass readings and a short little blurb about them, still feeling pretty anxious. So I find the devotional tab and I read Tuesday’s .. then the day before.. then all the way back to the Epiphany.. at this point I’ve tested up some and I’m feeling a little more at peace but there is still just this anxiety in my heart that won’t settle down. I’m like ok it’s almost 5 am and i haven’t slept I’ll just read one more. This was the “one more.” So this one is different, it has that little exercise at the beginning. Read the scripture about the sky opening and the spirit descending like a dove. Close your eyes and imagine Jesus’ baptism. So I did. I could see the river, people on the bank, John the Baptist & Jesus but not the sky. Where the The spirit, the dove & the sky should be- all black, totally nothingness. The devotional said “ask the Holy Spirit to bless your imagination” so I did. Still nothingness, cold empty, nothing. But in that moment I remembered one of the other devotionals I had read asked why we don’t take our issues – even small ones like an issue at work to Jesus. So that’s what I did in that moment of nothingness, I took all my anxiety and fear and anger to Jesus. I cried and I asked for help and forgiveness and to let me remember the blessing of my own baptism. Right then, at that very moment – there it was- the sky opened up and there was Jesus in the river and light and warmth and love and all the anxiety melted away, and my heart felt light. Thank you ladies for all you do!